Prickly pear cactus can be a major problem in Florida pastures and rangelands, primarily because of how the plant reproduces. This weed spreads by fragmentation, so pieces of the primary plant can form roots and new colonies. Therefor, mowing can increase the problem of prickly pear by spreading cuttings throughout the pasture. Prickly pear cactus does not out-compete grass species, but inhibits grazing. Quills from the plant can get stuck throughout the body and, if not removed, can cause infection and discomfort. Animals will choose not to graze near prickly pear, decreasing the amount of pasture utilized for forage intake. Spot spraying with fluroxypyr, the active ingredient in Vista XRT and TrumpCard is effective. Broadcasting Vista XRT at 22ox/A in either the spring or fall have also been effective, as well as split application of the same herbicide at 11oz/A in the spring and fall. Additionally, a split application of TrumpCard at 48oz/A in the spring and fall works to control prickly pear cactus. 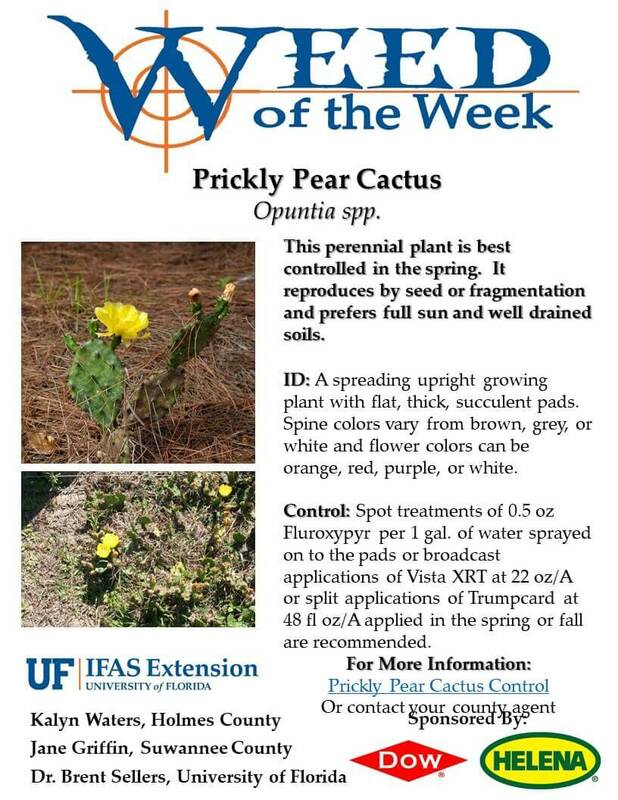 Please see he EDIS document Prickly Pear Cactus Control in Pastures for more information or contact your local UF/IFAS Extension Agent.